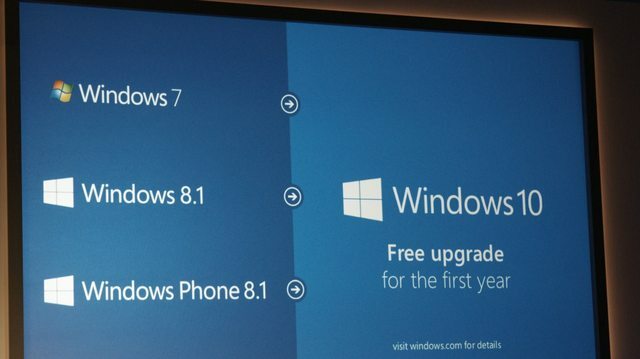 Windows 10 will be available for free if you have Windows 7, Windows 8.1 or Windows Phone 8.1. But you have to upgrade in the first year after the launch of Windows 10. Terry Myerson, Microsoft's Executive Vice President of Windows, said today that "This is more than a one-time upgrade: once a Windows device is upgraded to Windows 10, we will continue to keep it current for the supported lifetime of the device - at no additional charge." How exactly Microsoft will release the OS for the Windows 7 and 8 users? I hope we will be provided with a serial key and an ISO disk image. Because if Microsoft decides to release the OS via Windows Update then we can't format and install Windows 10 again after a year. What a great news. I feel like dancing today. This is freaking awesome! I got Windows 7 pre-installed, upgraded to Windows 8 for $15 using the launch-offer, and now getting Windows 10 for free! I am very curious how big the downloadf ... AND would it keep personal settings and my applications ? I'm sure we Win7 and 8 users will get a serial key, as what MS did with the free Media Center promotion when Win8 was launched. The final build will be about 4 GB in size because that's the size of Windows 10 Technical Preview x64. You can download Win 8.1 ISOs even now, so I'm quite confident that you can just download it and put it on something bootable. Did people get a new serial key for Windows 7 to 8 upgrade? I think it will be the same like that then. Did people get a new serial key for Windows 7 to 8 upgrade? Yes, Microsoft offered a serial key, an upgrade tool and an ISO file for the clean install. I read on neogaf that this is a permanent upgrade and you can't downgrade to Window 8 or 7 later. Oh man, I can't wait. Thanks Microsoft lol. I am curious that ... as I will upgrade through Windows Update ... would I still have desktops apps and stuff ? Windows 10 should include downgrade rights, just as any other release has had. I mean. Would this update ... erase my Adobe Create Cloud abd my browsers. My question is.,, would u have to reinstall all applications ?